This morning dawned with clear skies, warm sun, and tiger trout rising to flying ants at our camp along the lightly forested north shore of Dead Horse Lake. Eden and Mike packed up first. This was to be their last day on the trail and they would walk out the West Fork of the Black Fork River trail, nine or so miles to a trailhead where a shuttle would pick them up. I thoroughly enjoyed their company. I will miss the Rabbi and the Big Persian on the rest of this trek. Dan, Chase and I left camp en route to Dead Horse Pass. The terror of this climb has stared us in the face for the past 36 hours. All we could think about was the uncertainty that came with not knowing much about the route, hearing rockfall topple down it in the middle of the night, and wondering how the heck we were going to get through the cliff band safely. But alas, a trail up and through the pass not only exists on the map but through Real Life Dead Horse Pass too. Many adjectives can be used to describe the trail, depending on if you are an experienced hiker (“awesome!”), an intermediate hiker (“whoa…”), a beginner (“terrifying”), an introvert (“I need a nap at the end of this”), an extrovert (“I need to post an update to Facebook right now!”), a blind ignorant (“that was pretty”), or a realist (“thank God that’s over”). Regardless of where you stand, one thing is certain: the north side of Dead Horse Pass is one of the most spectacular trails in North America. There is talus, and scree. There is a real possibility that a misstep could have really bad consequences. And yep, there is a dead horse. The whole experience was a real treat. We stopped for some time at the pass itself to enjoy food and views. While sitting on the fine scree surface next to the cairn, gusts of wind threatened to blow us back to Dead Horse Lake. Even eating lunch was impossible. So we packed up and proceeded to work our way down the steep trail on the south side of the pass to the Rock Creek Shelf. The Rock Creek shelf – a series of tundra benches that sit at an elevation of about 11,000 to 11,300 feet – makes up a key component of the Uinta High Route, the 100-mile (mostly off-trail) traverse of the entire range from end to end. I remember it fondly in both of my UHR treks from years past. The shelf is comprised of tundra benches and small talus fields with several tiny tarns, spongy bogs, and ledge seeps. The walking is easy and because you are traveling on high ledges above the treeline and the trails, the views are vast, with big peaks above you and the huge valleys and canyons of Rock Creek and its tributaries to your downside. We arrived at Continent Lake for a break and I made a mental note to return here at some point in the future after seeing its … “nice trout” cruising the deep green depths among talus boulders submerged on its shores. From Continent Lake we traveled around a buttress that separates the Fall Creek drainage (a tributary of Rock Creek) and the Rock Creek drainage. The route from the lake proceed south over tundra, then crosses a talus field to the top of a tiny stand of subalpine where a sneaky ledge system can be accessed. Accessing The Sneak avoids having to drop down into the trees and on the Highline Trail (boring!). It also avoids traveling across the steep talus field at the buttress toe. Instead, The Sneak offers flat stone shelves interspersed with tundra and bogs. The views are nice and you get the feeling that you are a cowboy trying to avoid the Indians when you’re walking it. It’s the sort of place where a Louis L’Amour hideout could be located. 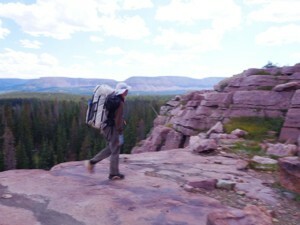 Eventually The Sneak dumped us onto the main Rock Creek Shelf southeast of Jodie Lake with easy walking around the rim and one of the Uinta’s best views: the Yard Peak massif. After stopping to refill water at a brook-fall dripping over a 15 foot cliff (and then drying in the sun because I got soaked standing under the drips), we made our final push for the day to Reconnaissance Lake (11,145 feet) to make camp. Reconnaissance Lake is one of the Uinta’s most scenic views, tucked right up against the Yard Peak massif. From our camp on the lake’s south shore on a tiny tundra patch next to a talus field, we have expansive sunset views down valley, massive cliffs overhead, and of course the beautiful Reconnaissance Lake itself. Chase and I fished a bit this evening and he slayed the brookies in the tiny ponds that have formed in the outlet stream bogs south of the big lake. It’s cold, windy and exposed here and reminds us that we are in the mountains. Tonight was the first night of the trip where I actually had to cook dinner while wearing my down parka. I spent extra time staking my tarp in a low, storm pitch with extra guy lines before going to bed, listening to the wind whistling in the cliffs above and feeling the fatigue of mountain travel in my feet, thighs, and back. Photo: Trekking through “The Sneak” – a system of narrow ledges between 11,080 feet and 11,120 feet south of the buttress that divides Jodie and Continent Lakes.